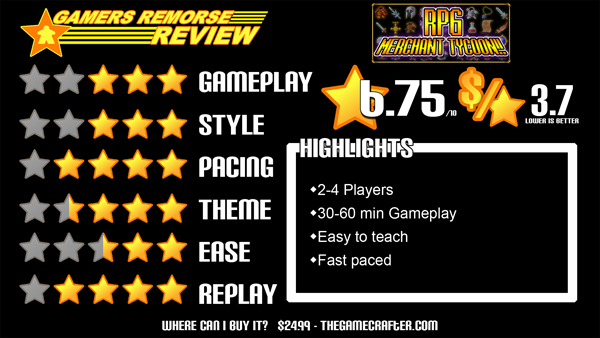 RPG Merchant Tycoon is a 2-4 player game with an estimated play time of 30-60 minutes; designed by Fierce Punch Games. The end goal in RPGMT is to be the player with the most ‘Market Dominance’ at the end of the game. What does that mean? It means you need to amass a ton of gold, awesome loot, and a decent clientele. The end game triggers when the final client’s order has been fulfilled. Upon triggering the end game players will calculate their Market Dominance and determine who is best fit to run a market in the case they find themselves stuck in an 8-bit fantasy realm. This process is done by getting 1 point for every client you have in your ‘fulfilled client’ area, 1 point for every 3 gold you have, and 1 point for every 3 loot quality points you have in your shop display. Play begins by shuffling the clients according to their ‘Gold Bracket’ (1, 2, 3, 4, and 5) then drawing 2, 4, or 5 of each bracket dependant upon if you are playing a 2, 3, or 4 player game. The piles are then stacked so the level one ‘gold bracket’ clients are on top with level 5 on the bottom. 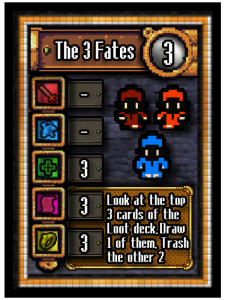 Each client car has a name (The 3 Fates), gold bracket (3), order (3 healing, 3 spells, 3 accessories), and favor text (keep 1 of the 3 top cards from the loot deck). The gold value indicates how much you as a merchant will get paid for completing their order. Their favor is what you get in response for fulfilling their order; these favors can range from amazing to mediocre. Their order is than a chart showing each of the 5 types of loot with a value; to fulfill an order you must provide the client with the goods they seek with a quality equal to or greater than the value on their card. The loot cards are fairly simple; they have a number, illustrating the objects quality and an image illustrating the loots type; weapon, armor, healing, spells, or accessories. There are also wild cards which have a question mark. Each player is dealt 10 cards and chooses 5 of them to put in their shop’s display while the remaining five remain in their stock. The remaining cards are set aside as a loot deck. So what cards do you want on display and what do you want in stock? Another great question! First player is decided by the player with the highest sum value of cards on display at the start of the game. You likely don’t want to just drop all of your high value cards on to display, however, as to fulfill orders you must use the objects in your stock and one of the actions available to players is to “trade” cards between their display and another player’s display. Trade – trade any combinations of your display item(s) with those of one other player’s display items. When a client’s order has been fulfilled the used cards are discarded, the client placed behind the active player’s display, the favor is activated, and another client is added to the list from the top of the client pile. So thats how the game plays; but what did we think of it? The game was one that I was excited to try as on paper it didn’t sound like it work for me. That opinion may have been part of the game’s saving grace; for it’s easy to surpass expectations when said expectations are low. The game took my by pleasant surprise, however, as I found it easy enough to play; though the 12 page 8-bit small print rulebook was a bit daunting and took some work to get through. The game is paced fairly well though there is plenty of room for analysis paralysis with the wrong play group with all the various clients and displays to manage; this potential paralysis grows with the player count, as a two player game, however, I found it flowing quite well. That is until there were a limited number of clients before triggering the end game and our turns consisted of fighting over the same needed resources until we realised we wouldn’t find a way to end our resource battle without sacrificing too much to the opponent. The graphics were fun and the 8-bit was done well; I am, however, (bracing for trolls) growing tired of the 8 bit theme. It has been done… for 15 years now… we have better technology; it is time we upgrade our bit rates. The balance was there; though a more strategical savvy player will likely have an advantage in their ability to sacrifice fulfilling certain high cost clients that others may fight over for the sake of amassing a hoard of lower valued clients; if all players are on an even footing, however, this will be much less of an issue with the exception of an instance arriving like Sean and I ran into as detailed above. The theme in this was one that is fluid; the 5 objects can easily rotate out and the theme rotate with that; players could be running a restaurant, department store, or any other form of custom order location; that being said I did appreciate the fantasy RPG setting. The replayability is there as well as the clients have a chance of altering and the order they arrive is will very likely change, but the lack of theme dependance leads this to being little more than a hand management pick up and deliver game. I would play it from time to time but I don’t think I’d be the one bringing it to the table much after the first few plays. All-In-All RPG Merchant Tycoon is a descent game that is worth the fairly reasonable price. This may not be a game you will take with you to every game night for the next few months, but you will likely feel you got your money’s worth after just a few rounds.